Love is the moment of every single breathe you spend with your lover. The feelings so repressed in past have taken shape in the present and now you want to metamorphose your love into a marital bliss forever. Let your marriage life blissful with a precious ring that celebrates a coupleÃ¢€â„¢s commitment for their everlasting love. 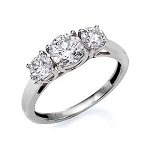 Show her that sheÃ¢€â„¢s loved and make a powerful statement of true love with 3 stone diamond rings, each facet symbolising friendship, love and fidelity. A perfect 3 Stone Diamond Rings will have 3 pieces of brilliant cut solitaires pronged to solid 14k gold or 18k gold in white or yellow gold. 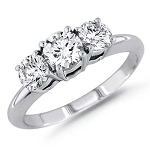 Choosing three stone solitaire diamond rings for your special day may be an unchartered territory for you, for it will be a new experience all together. 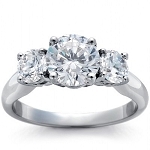 Even you have that excitement and panic at the same time while solitaire ring shopping, you must have no idea where to begin. A well research to guarantee that the perfect ring you choose will be the perfect sign of love you want to share with your future spouse. 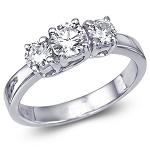 Nothing can be exciting and delightful when you browse for the three stone diamond solitaire rings at Queen Jewels. Let your style bloom with the beautiful Queen Jewels rings collection. Graceful yet light hearted diamond solitaire, our mesmerising designs will capture light and attention of the audiences at every angle. 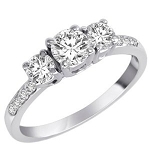 Choose from our selection the conflict free diamond jewelry that could be a perfect addition to her jewelry box. 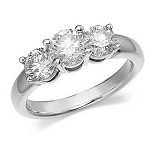 Step into the encoring luxury of the 3 stone diamond rings that can surprise your would-be spouse who has been dreaming for a precious gift since her childhood. At Queen Jewels, get the dazzling solitaire with varying sizes and shapes. 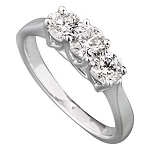 Variation to the highest, you can get this ring with a set of three diamond rings at different colours or a favourite gemstone (ruby or sapphire) in the centre with two diamonds at both the sides. Whichever you choose, we make sure you get the ultimate experience like never before. 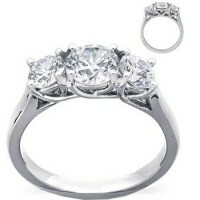 Queen JewelsÃ¢€â„¢ 3 stone diamond solitaire rings are always demanding for both engagement ring and wedding ring. 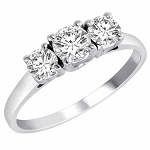 Simple yet always a showstopper, they are the superlative choice that can surely win her compliments every day. Our varying solitaire diamond rings fuse classic with modern style that can give you high esteemed quality with sophistication and dignity. 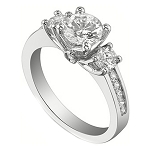 Refined and brilliantly cut, every diamond is carefully polished offering intricate and detailed designing. Thinking of the budget? 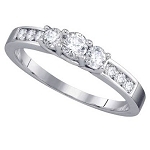 Why make a compromise when you are looking for the gift of life at Queen Jewels. 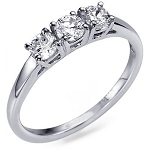 Our customised three stone solitaire diamond engagement or wedding rings come with incredible discounted prices. 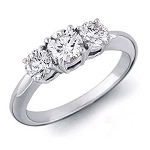 From round cut solitaire ring to princess cut ring, you have the full freedom to select three stone ring with either 1 carat diamond ring or 2 carat diamond ring uptill 5 carat diamond ring or more; at much lesser cost. 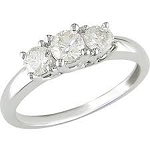 If you want to buy a ring to have variety, symbolism and personality, consider a three stone solitaire ring. 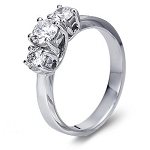 Shop breathtaking 3 Stone Diamond rings from Queen Jewels that will make her happy forever.